Hello! 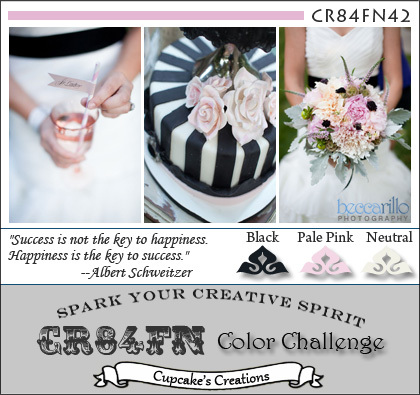 It's time for a brand new CR84FN Challenge! CR84FN42 will last for 2 weeks. Our color palette is Black, Pale Pink and Neutral. Photos courtesy of Becca Rillo Photography. Please welcome our newest guest designer, Mackie Robertson of Mackie Made Paper! I used the sweet Pure Innocence - Precious Little Lamb Where Flowers Bloom on my card today. I colored, pieced his outfit, cut him out and popped him up on my oval panel which is matted onto a Die-namics Oval Decorative Doily. I added my sentiment to a small tag die cut with the Die-namics Dog Tag. I added some tiny ivory pearls (from Pizzazz Aplenty) to the center of each flower. Accessories: Die-namics Oval Decorative Doily, Die-namics Dog Tag (My Favorite Things); Oval Nestabilities (Spellbinders), Corner Chomper (WRMK), Markers (Copic), Pearls (Pizzazz Aplenty), Seam binding, Rose, Twine (May Arts), Foam tape, Thread, Sewing machine. Stephanie - this is such a cute image. I do like the paper pieced suit and sweet bunch of flowers. Love that oval - such a pretty background. Gorgeous! Oh, this little lamb is adorable! I just love his outfit! The little pearls are perfect. Sweet, sweet card! Adorable card! He looks cute in his little outfit! Sweet design! goodness this is just so incredibly adorable!! OH MY GOODNESS Stephanie...I absolutley adore this!!! I think this is my favorite card of yours :) This little lamb is adorable and the wee pearls in the flowers ~ CUTE!! Totally smitten...excellent job!!! Oh what a joyful card. So very soft and sweet. Love the oval doily. Stephanie, that lamb is so PRECIOUS! LOVE the pearl detail on the flowers and how you layered your papers and doily! FAB stitching, too! Just an Adorable card!!! How sweet is he! Love the added paper pieceing and added doily! I have to say, I didn't care for this image when I saw it on the MFT blog, BUT you have turned me. So stinkin' cute! I love the tweed outfit she has on. Beautiful as always Stephanie. Stephanie! This is AMAZING!!! WOW! I love that sweet little image! So darn sweet!!! OMGosh, this is absolutely precious, Stephanie. WOW! the black, pink cream is such a great colour combo and so eye catching! I love this wee lambie and is paper pieced suit too. Such a beautiful card! Awwww! This is so adorable! That doily is wonderful and your customized outfit is handsome! Love it all! What an adorable little lamb, and your cutting and coloring skills are awesome! The paper piecing is darling too! I love the whole card. OmGosh this is soo Darned Cute Miss Stephanie! Love your Wonderful coloring and paper piecing on your Sweet little lamb.. Just so Precious!